the whole readme for more info. jump with ALT, run with CTRL. 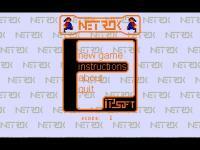 Netrok is a GPL open source SDL game for linux and Windows. you have to destroy the enemies different, and you have to react fast. 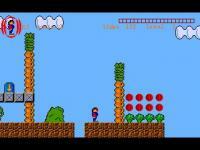 later in the level, which is also risky, because you could die before. Place your level jump'in flag with DELETE. to jump on the prickles. Netrok cannot beaten the big prickles, so try to avoid them. shields, dropping jump`in flag etc. beat the level in shorter time or kill enemies..
For every 5000 points score you get 1 UP.